I found a copy of a great old book called Cars That Never Were in a used bookstore, behind a secret door marked with a pair of crossed pistons and reeking of old motor oil and decay. The book is full of interesting prototypes, but one caught my eye especially because of its novel design and engine choice. 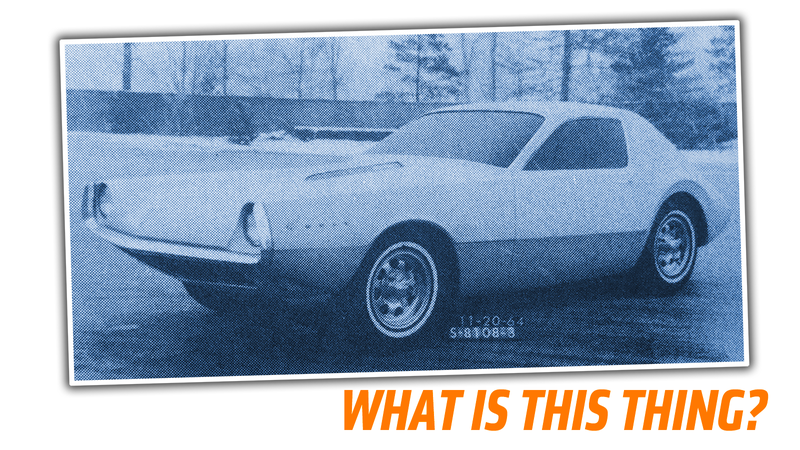 It’s a 1964 Ford prototype/styling mockup badged “Colt V-4,” and I can’t seem to find anything about it on this big, wide internet. I have reached out to Ford itself, in the hopes there’s something in its archives, but I’m fundamentally an impatient man so I’m writing about it right now, because you, sweet, sweet readers, you shouldn’t be deprived of this breaking 54-year-old news for another second. I think the Colt V4 is an offshoot of the Cardinal project, perhaps an attempt to make a sporty front-wheel drive coupé from the Cardinal platform and mechanicals. That V4 engine design was also used in the first Mustang concept car, a wildly-un-Mustang-like open-topped, mid-engined two-seater. The design of the Colt V4 almost reminds me of a shrunken version of another famous American front-wheel-drive car, the Oldsmobile Toronado. The long-hood/short deck proportions would work well for an FWD layout, and the rear seems to be a straight fastback slope from roof to the bumper line. The front end design is novel as well, with a grill-less design, at least above the bumper, and some interesting chrome-hooded headlights. There also seems to be some kind of hood power bulge/venting going on. It’s a strong design, I think, and the idea of a sporty FWD car like this would have been way ahead of its time. If I hear anything back from Ford, I promise I’ll tell you everything. You have a right to know.